Recently, I had the opportunity to stay at Valero Grand Suites by Swiss-Belhotel which is on soft opening. 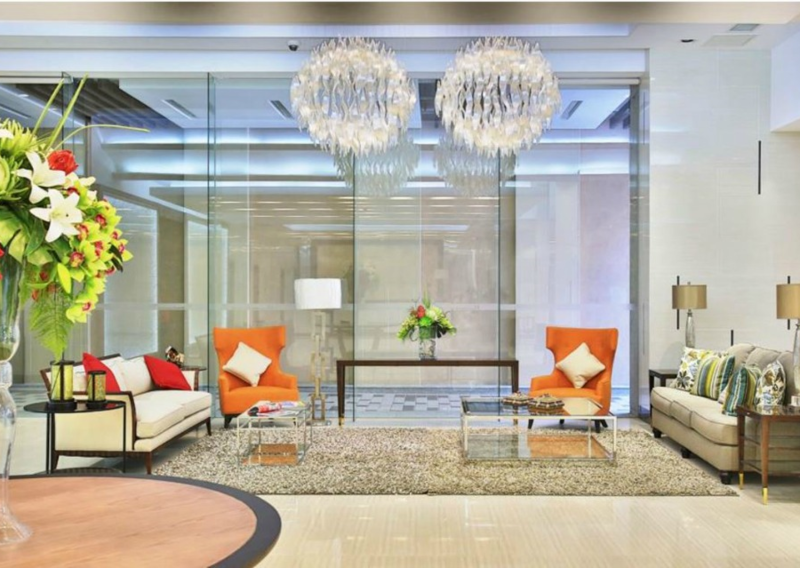 The hotel is the new home for business travelers, family, or friends who crave for a staycation in the city. The 33-stories-high skyscraper adds up to the breathtaking skyline of Makati—the city of flair, life, fashion, multi culture and business in Metro Manila. “I think it’s the people. My team have come from different industries, but we are all bonded by love and hospitality. We really love our guest. I always speak well about my people, not only because of who they are, but also of who they will be. They are very approachable. 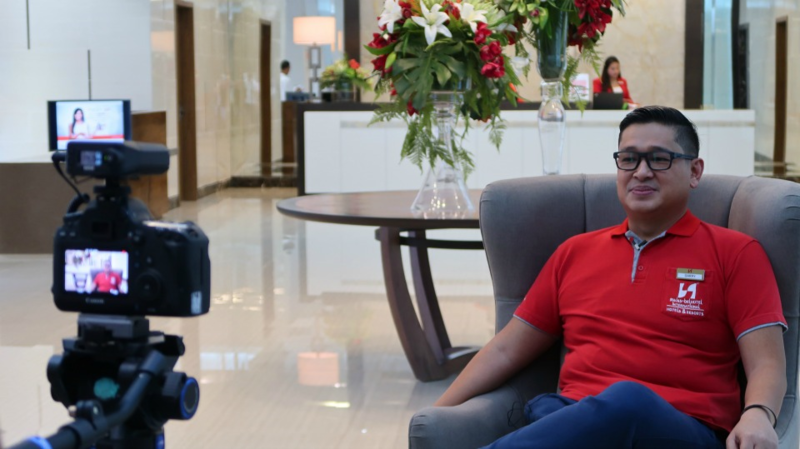 I think any property would be the same, but it’s the people who would give them a unique experience,” Mr. Garry Garcia, the General Manager, explained when I asked him why guests should choose Valero Grand Suites by Swiss-Belhotel over hundreds of hotels in Makati. 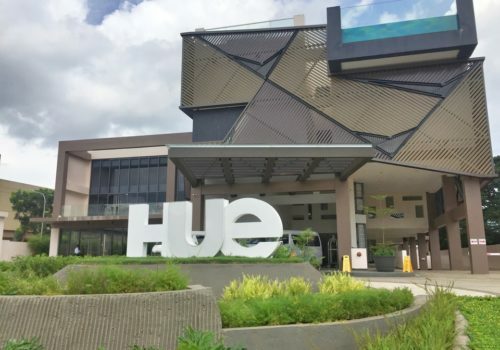 “We have gone through a lot of training given to us by Swiss-Belhotel International and of course, as I’ve said, it’s really our people who give the best experience. We selected them carefully. 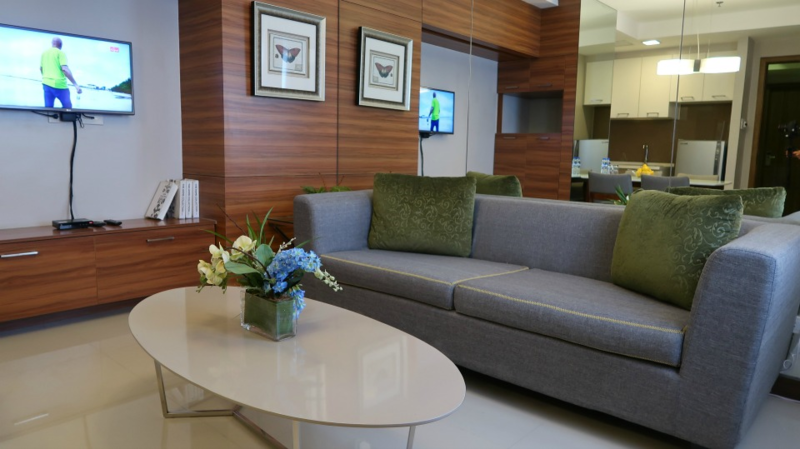 This is paramount, as we need to give guests the perfect balance between the feeling of home and the convenience of having everything in a business hotel,” he added. I couldn’t agree more with Sir Garry. The hotel staff made us feel comfortable and gave us the feeling of being at home during our stay. They were always smiling, helpful with our inquiries, and fast to respond to any of our needs. 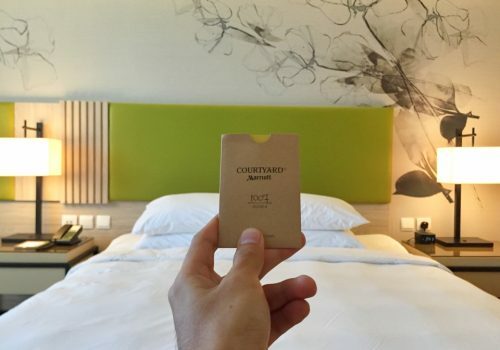 What makes the place different compared to the rest of the hotels I stayed at in Manila? The answer is simple and surprising. All of their 271 rooms were tastefully designed. They’re spacious enough to make you feel at home while you’re away from home. My team and I got two rooms. I stayed in a Premier room, measuring about 29-36 sqm. 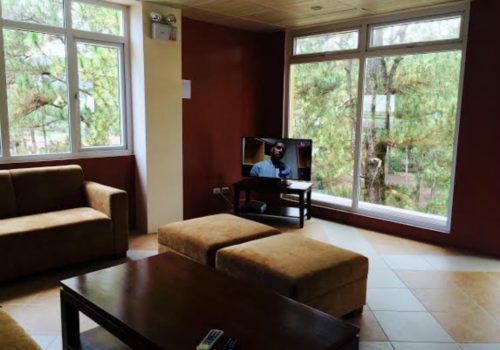 It’s air-conditioned, with twin beds, a flat screen TV that’s connected to the cable, and refrigerator—all the usual things you see in a hotel room. 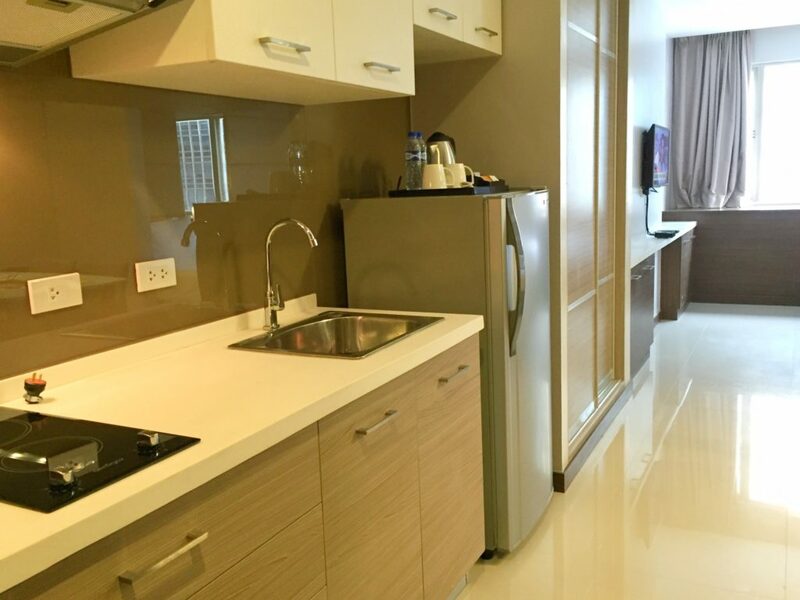 What surprised me was the four-seater dining set, the kitchenette that has an induction stove, and the bathroom with a bathtub—all for P3,888 or US$78! Wow! The value that you get out of that sum is really hard to beat. I highly recommend this room to friends who want to try staycation. The other room that we got was a one-bedroom suite, perfect for a couple, or a solo business traveler. It has everything you need whenever you’re away from home. There are two air-conditioning units for the bedroom, living, and dining room area. It has a flat screen TV, full-size refrigerator, kitchenette with an induction stove and electric kettle, four-seater dining table, sofa bed and bathroom with walk-in shower. So, why choose another hotel that will just give you the usual? Valero Grand Suites can give you everything you need. And before I forget, your stay comes with FREE High-speed internet and Wi-Fi access. And the price? It’s an unbeatable P5,388 or US$108. Sounds like a good deal? Then you should consider staying at the hotel really soon! If you come in a big group, you don’t need to worry. They understand your needs, so they created a two- and three-bedroom suites. Can’t imagine how big those rooms are? Well, I think they would be as spacious as 123 sqm. The two-bedroom suite has a room with one queen size bed and another that has two single beds. It has a living and dining area, complete with everything you would expect in a hotel. To my surprise, it has four bathrooms. Yes! I have never been to a hotel with four bathrooms—two powder rooms, one walk-in shower, and one with a bathtub. The place also has a balcony, perfect for a BBQ party. If you think it’s expensive, it’s unbelievably not. 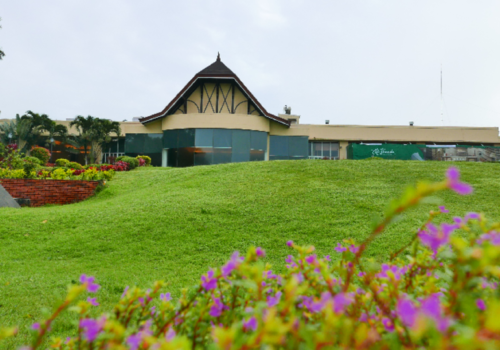 Price is around P7,000 or US$140 per night. The location of the hotel is convenient. It’s near restaurants, coffee shops, and convenience stores. There are drugstores, salons, and banks within the area. And if you walk a little further to the south, you will be surprised to see more establishments. 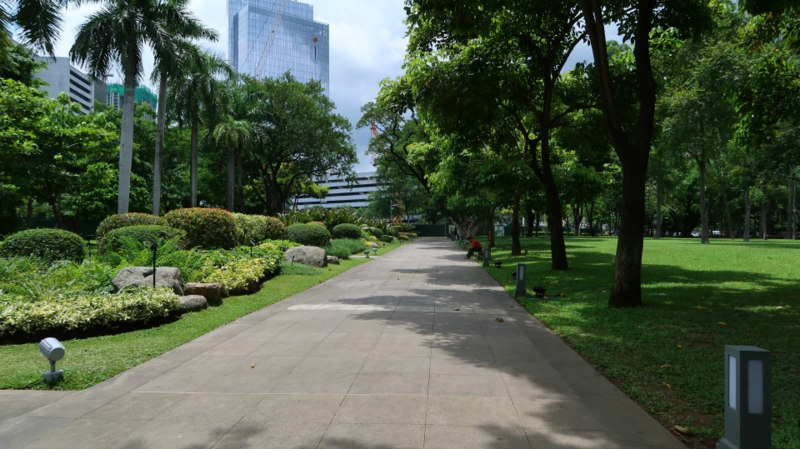 From Valero Grand Suites by Swiss-Belhotel, you will reach by a few minutes of walking the Ayala triangle and the famous Ayala Avenue—the heart of the Makati Central Business District. Because of many businesses located along that road, it is dubbed as the Wall Street of the Philippines. Therefore, if you’re visiting Manila for a business trip, look no further. The hotel is close to most, if not all, the major business offices in the city. Valero Grand Suites by Swiss-Belhotel houses Casa Valeros where we enjoyed delicious local and international dishes. 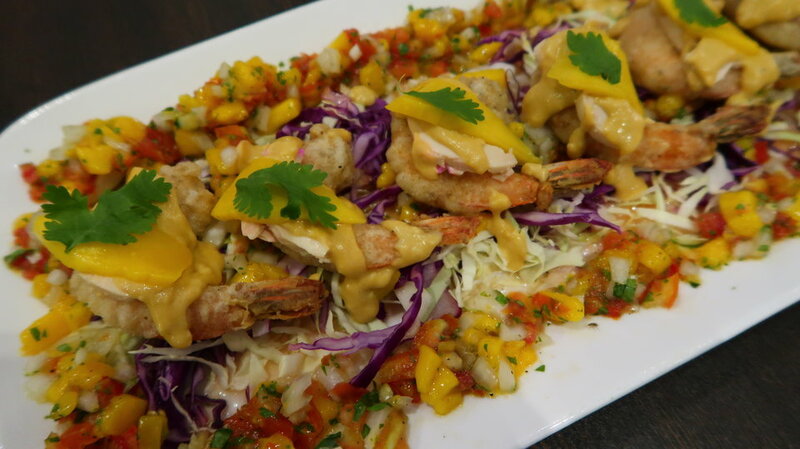 We started with an appetizer—shrimp poppers with salted egg paste on top surrounded by fresh mango salsa. It’s my favorite. It’s a must-try. Another highly recommended dish is their version of pinakbet, a Filipino dish from the northern region of the Philippines. It’s composed of mixed vegetables steamed in shrimp sauce. I love their presentation! We mixed the pork and vegetables. It’s so flavorful and the meat was cooked well. We also tried their Chicken in Lemon Sauce, Savory Chicken, and Spanish Sardines Linguine. You can never go wrong with their wide selection of international cuisine. They also serve pizza, burger, noodles and much more. 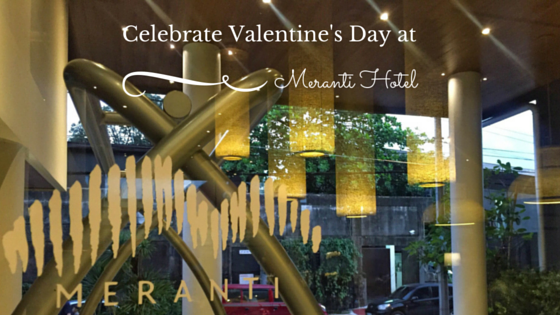 They currently have an ongoing promotion for a buffet lunch, Monday-Friday, 11 am to 2 pm for only P499. You can also enjoy their happy hour, Monday-Saturday, 3 pm-8 pm. Buy two bottles of San Miguel Beer Light, or Pale Pilsen and get one free bottle. Valero Grand Suites by Swiss-Belhotel is expected to be fully operational in the 3rd week of September. Which made me excited, since I want to experience their pool and gym, located on the 33rd floor which is the highest location of a swimming pool in the area. Imagine swimming while enjoying the view of the Makati skyline. This is something to look forward to my next visit. For inquiries, you can send them an email to inquiriesvgsb@swiss-belhotel.com, or call at (63) 2 356 0350-53. For more details, visit their website by clicking on this link. Book with Booking.com to get a discounted rate! 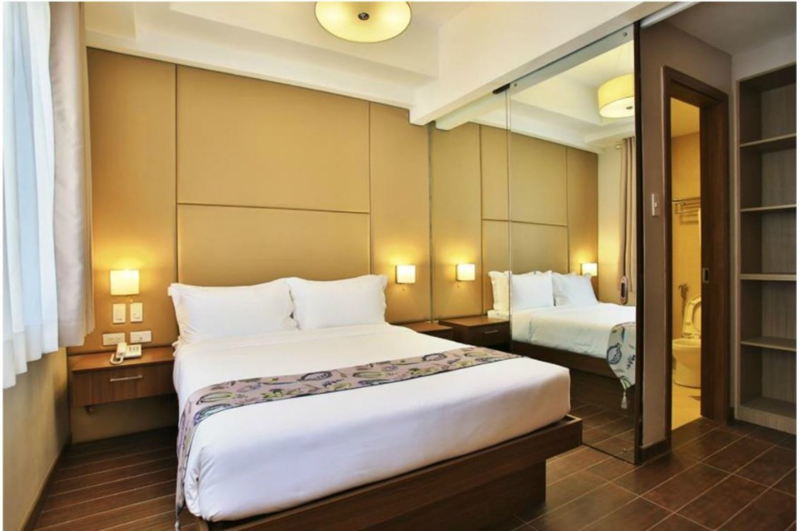 Note: This is a sponsored stay with Valero Grand Suites by Swiss-Belhotel . All views, posts and opinions shared here are my own. Special Thanks to Ms. Mabel Tobias and Raymond Carl Rivera for assisting us! This looks very nice! I love the lights in the lobby! That chicken looks phenomenal! I’m glad that the accommodation and the food were up to par! 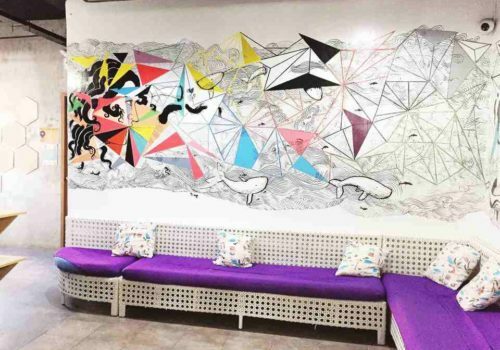 Makati is a nice side of Manila to stay in! Wow that is a really nice hotel. Great rooms with ample space and the price is even better. The Valero Grand Suites sounds like a total bargain. Those rooms are HUGE and only for USD78!! Having spent a little time in the hotel industry I totally agree that the staff can 100% make or brake a place. You can have the fanciest hotel in the world but if the staff are a bunch of miserable, unhelpful sods you never want to go back. Salted egg paste on shrimp poppers sounds kind of weird but looks pretty tasty! That looks like an amazing hotel! 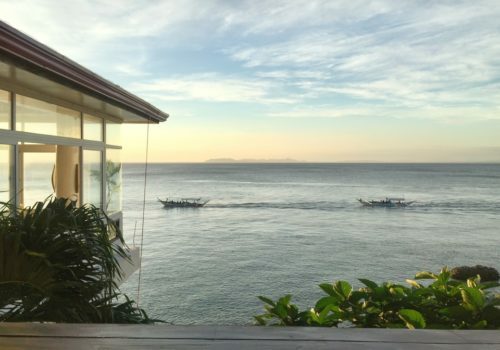 I’d love to visit Manila and now I know where to stay. What a chic and modern hotel and such a value! I will definitely be keeping the Valero Grand Suites in mind when I make it out to Manilla. 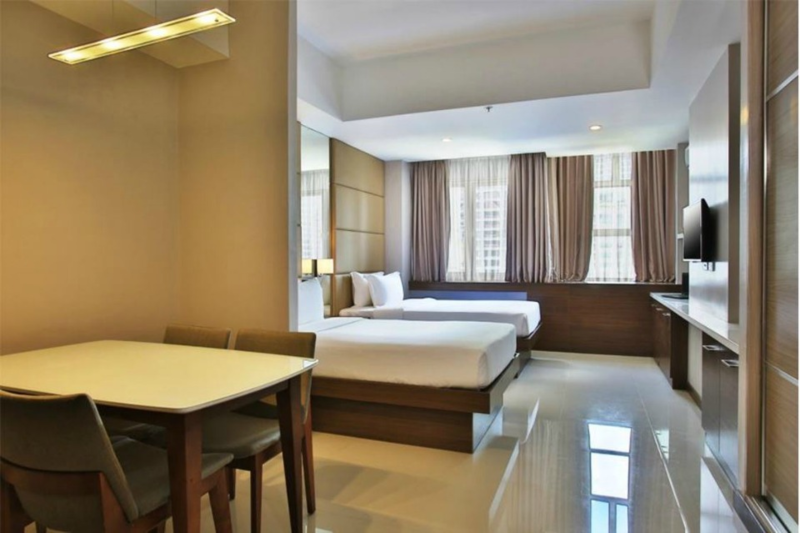 Valero Grand Suites sounds ideal for traveling in and around Makati. The location sounds perfect, and I love how it really seems to be set up for comfort. I also love how the suites have useable work spaces. Too often I get into a hotel room and there isn’t a comfortable place to sit down and get work done. This looks perfect! And that food!! Yum! Thanks for sharing! This hotel looks beautiful! I love all the different options for room sizes too! Seems perfect for anyone’s situation of budget. And the food sounds great too! Will definitely have to look this place up whenever we are in town! Valero looks like a great place especially if you have a longer stay. With all the amenities, the rooms look like mini apartments. Yup this is really a good choice in Makati! This looks like such a cool place to stay. I love the modern / sleek look of it. This hotel looks like the lap of luxury. It would be the perfect place to relax on vacation or set up as a base for a work trip. Comfort, practicality, and convenience are the key themes I take away from your article. I stayed in the Makati area when I visited the Philippines last year and convenience is key. The traffic can be horrendous so a place near Ayala center sounds perfect. Will have to check out Valero Grand Suites on my next trip the Philippines. Almost 4k is not bad for suite with kitchen and bath tub! 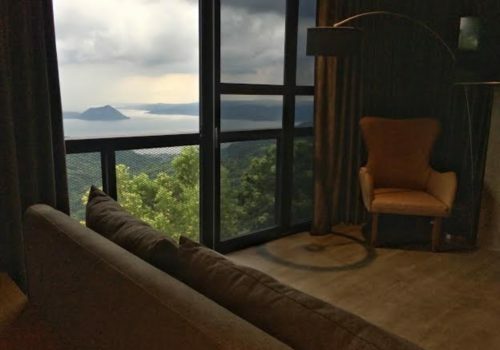 And the 2BR suite is sulit for 7k. 4 star sila? This looks phenomenal! My cousin and his wife lived in a penthouse in Makati, so we stayed with them when we were there. So, I LOVE that section of Manila! Now that they’ve moved to the States, I’d have to find a good spot and this looks like amazing luxury to me! That lunch buffet is really great and affordable. I would definitely check that out. I also liked that chicken with lemon sauce. That sounds so mouth watering. I like this hotel, It is in a good location for that matter. I should tell my family about this for our next staycation. This hotel looks so nice! And I appreciate the fact that they care so much about hospitality, it’s nice to feel at home even when you’re traveling!